Technically speaking, Buena Esperanza Alfaro is a lot from Hacienda Santa Rosa in Huehuetenango, Guatemala owned by Gustavo Alfaro. It's a separate plot at about 1800m that we picked up because of a unique varietal. Well, it's not exactly unique, it's a varietal that rightfully doesn't get a lot of respect because where it's commonly grown is fairly low elevation (mostly in Brazil) with poorer results. We're talking about Mundo Nuevo, which would cause many a seasoned coffee pro to do a double take and question whether it could be good and why someone would plant it this high. It's actually exceptional at this high elevation on his farm and has gotten rave reviews out of the gate from top barista locally. 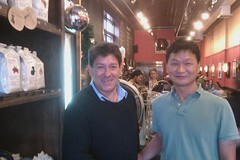 It was a bit of a competition to get this coffee from him after word got out about how it was cupping. When we tasted it blind, it stood out in a big way and still holds up in production. It has been uniquely honey crisp apple (a note that shows up in many of the Santa Rosa coffees) while floral pear blossom on the nose followed macadamia nut and nougat in the cup. Next to the lot of Mundo Nuevo, there is some Tekisik that should have a good yield next crop for a more traditional bourbon style Huehuetenango offering. There are plans to plant some experimental lots as well, including some African varietals, so the hopes are high at the aptly named 'good hope'. The owner of Hacienda Santa Rosa is the charismatic and creative Gustavo Alfaro, a fourth generation owner of Santa Rosa. Gustavo recently came out to visit us and we chose to do a quick cafe crawl. It was a great experience where many ideas were exchanged over a lot of coffee and good food with friends. Gustavo made instant relationships among the community as we visited shops and did our best to be good hosts. In it's essence, we were explaining both his story and the personalities of those that would be representing his coffees. Both Gustavo and those he met gained from the experience in a lot of ways. We feel like he came away with a clear understanding for the strong community that exists here, not just the excitement, but truly the sincerity behind it. Gustavo had one strong commentary after tasting our Zone10 espresso, an all Guatemala espresso named after the Zona Viva in Guatemala City. 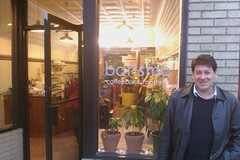 He wanted us to change it to Zona10 and to have just his coffees in it! We'll take it under advisement have a special Alfaro edition in the spring with artwork based on his ideas just in time for the NERBC. Rumor has it that a local barista is going to compete with this after meeting Gustavo! For us, the experience was a reaffirmation to keep working hard and moving forward with big ideas. We've been blessed by good fortune to find people along the way who understand us and get excited about coffee the way we do. After years of hearing the critics, many people are coming around to the same seriousness we feel about coffee. 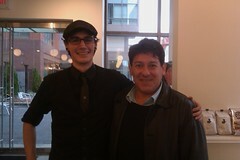 We feel like Gustavo is one of those people and are looking forward to working with him in the years to come. Limited Release El Bosque Sample Pack!